Almonds contain a lot of beneficial ingredients that can boost your overall health. However, eating too many almonds can lead to weight gain and other side effects. Almonds are a very nutritious food that is high in fat but low in trans-fats and cholesterol free. They have plenty of nutrients like calcium, phosphorus, vitamin E, fiber and antioxidants that can help your overall health. It has been found that you can lower your cholesterol by eating a handful of almonds each day. Because they are so beneficial and they taste so good, it can be easy to eat too many. It may seem surprising, but eating too many can actually be dangerous, so it is important not to overdo it. While they can lower your cholesterol, almonds are high in fat and calories with as many as 14g of fat and 163 calories per ounce. Eating too many of these nuts can make you gain weight if you cannot keep your energy up to burn off what you have been eating. You will need to account for the calories in almonds when setting up your meal plan so you can avoid consuming too much. Make sure you do not allow almonds to account for 20-35 percent of your daily calories if you follow a standard 2000 calorie diet to avoid gaining weight. Eating too many almonds can cause vitamin E overdose. Almonds have a very high amount of vitamin E, containing as much as 7.4 mg per ounce. This is nearly half of your daily requirement. However, you should not consume more than 1000 mg of vitamin E each day. If you are eating a diet that has a lot of sources of vitamin E like whole grains, fortified cereals, eggs or spinach you can wind up overdosing on this vitamin. Watch for headaches, lethargy, diarrhea or flatulence that may signal that you are suffering from this condition. Almond contain as much as 0.6 mg per ounce of manganese. People are supposed to consume 1.8-2.3 mg of manganese each day, but if you are eating a great deal of almonds on top of a diet rich in this mineral it can interact with medications you are taking. Antipsychotic drugs, laxatives, antacids, some antibiotics and blood pressure medications can interact poorly with high doses of manganese. Every ounce of almonds contains around 3.5 of fiber. This can be a dietary benefit because you need 25-38 g of fiber in your diet each day to keep your digestive system working properly. If you get too much fiber in your diet it can lead to abdominal bloating or constipation. Make sure you drink plenty of water if you eat a lot of almonds to help your body process all this fiber. Eating too many almonds can cause toxicity buildup. This is especially true if you eat bitter almonds because they contain a poisonous compound called hydrocyanic acid. 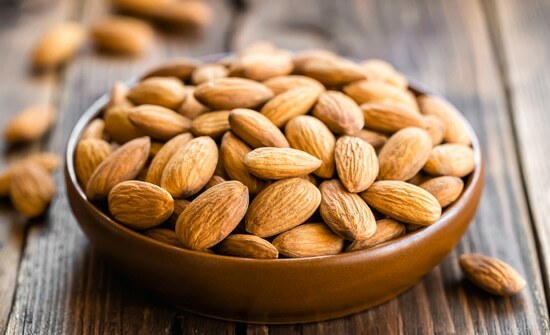 When eaten in moderation, bitter almonds help cure itch, spasms, and pain. However, overconsumption could lead to serious consequences, including choking, nervous breakdown, and even death. Be sure to avoid bitter almonds at all cost when you are pregnant or breastfeeding. You will be at a greater risk of developing kidney stones when you eat too many almonds. Calcium stones, the most common kidney stone, can occur due to excessive amount of stone-forming chemical compounds including calcium, oxalate or phosphate. And almonds are a rich source of these oxalates. You do not have to worry about it when you eat almonds in moderation because your body can process the oxalates in almonds more efficiently than oxalates from black beans and other foods. Still, you need to eat almonds with care, especially if you have a history of kidney stones. You may want to avoid overconsumption of almonds when you have tree nut allergy. Many people are allergic to nuts and eating almonds can trigger an allergic reaction in them, leading to side effects like breathlessness, swelling of mouth, and rashes. You may want to avoid almonds completely if using almond oil on your skin also triggers a reaction. Now you know that eating too many almonds can cause several side effects then how many should you eat to control your intake? Ideally, you should not be eating more than one ounce (about 23 almonds) a day. Weighing your almonds instead of counting them can help you make sure you are getting an accurate serving size when you eat them. Almonds can vary in size, making it difficult to get an accurate number if you are trying to watch your intake. You may want to be more careful if you are trying to lose weight because only three ounces of almonds contain about 500 calories. The same thing is true for almond butter and almond flour.